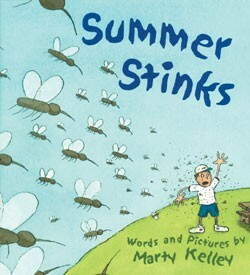 Summer Stinks. What more do you need to say about a hot, sweaty, bug-riddled season? Well, Marty Kelley has a few things to say and draw about the subject- 26 of them in fact. 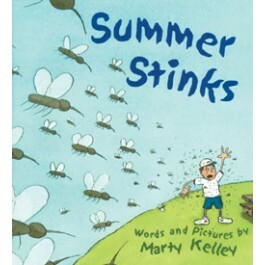 Summer Stinks takes a comic look at both the alphabet and summer. From "A is for ants" to "Z is for zapper," Summer Stinks shows why the author of Fall is Not Easy is one of the funniest authors and illustrators writing today! Full-color illustrations;jacketed, smyth-sewn, reinforced hardcover.